The woman who rebuilt the global consensus on climate change and helped make history as an architect of the Paris Agreement is heading to The Hague for One Young World’s 2018 Summit. 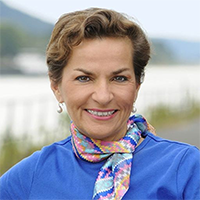 Christiana Figueres, who comes from Costa Rica, has created a new form of collaborative diplomacy which she is trying to use to help Governments work together to save the planet. During her six-year tenure as Executive Secretary of the United Nations Framework Convention on Climate Change (UNFCCC), she had a transformative effect on negotiations, introducing a spirit of fairness, transparency and collaboration. Her efforts culminated in 195 sovereign nations coming together to sign the historic Paris deal to keep global temperature rise this century below 2 degrees Celsius above pre-industrial levels and to pursue efforts to limit increases further to 1.5 degrees Celsius. Her role at UNFCCC under former Secretary-General Ban Ki-moon ended in July 2016, shortly before the election as United States President of Donald Trump, and Christiana has continued her climate change activism as a founding partner of Global Optimism, an enterprise focused on social and environmental change. Through Global Optimism she is convenor of Mission 2020, a global campaign to drive urgent action to reach a turning point on greenhouse gas emissions by 2020. Mission 2020 has set out six milestones to attaining that goal; switch to renewables, use zero emissions transport, build liveable cities, restore our forests, make industries green, and invest in climate action. Christiana, 61, was born in San José, Costa Rica, and her father, José Figueres Ferrer, was three-times president of the country. She has a masters degree in social anthropology from the London School of Economics. She is also currently a World Bank Climate Leader and an Advisory Board member of energy giant ENI, the global consumer goods company Unilever, and Formula E, the electric-powered motor racing championship. Christiana was a guest at a reception held by One Young World and Vanity Fair last year at Vogue House in London to mark coverage in the magazine of the 2016 One Young World Summit in Ottawa, at which Counsellors included Justin Trudeau and Meghan Markle.